At least 20 people were injured after an escalator in the Rome metropolitan system collapsed. At least 20 people were injured after an escalator in the Rome metropolitan system collapsed Tuesday night. A video shown on Sky TG24 shows the escalator accelerating suddenly and the people riding down on it collapsing on top of each other. The dramatic footage shows people on the parallel escalator trying to pull others to safety. The cause was not immediately known. The metropolitan station at Piazza Repubblica near the main Termini train station was closed by investigators. 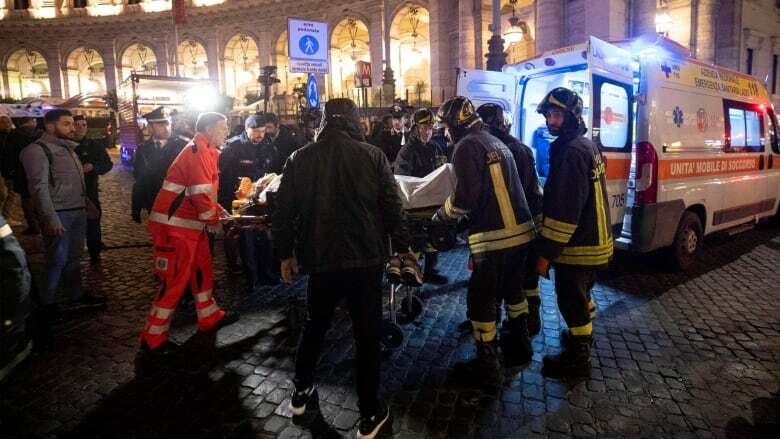 "The scene that we found was people piled up at the bottom of the escalator," said Rome provincial fire Chief Giampietro Boscaino. "People one on the top of the other looking for help. They had various injuries caused by the escalator that was twisted, therefore serious injuries." The prefect's office put the number of injured at 20, mostly Russians in town for a Champion's League soccer game between CSKA Moscow and Roma. Firefighters said seven were in serious condition. The news agency ANSA quoted Rome Mayor Virginia Raggi as saying that witnesses reported people were jumping and dancing on the escalator before the accident. ANSA also quoted city transport agency officials as saying maintenance is carried out on metro system escalators every month. Separately, one CSKA fan was slashed with a knife during clashes between opposing fans outside the Stadio Olimpico, the ANSA news agency reported. About 1,500 CSKA fans were attending the match.